Riverview now boasts some of the best bent greens in the State with subtle contours and shapes to challenge even the best putters. Nestled in the Four Corners area (Utah, Arizona, Colorado and New Mexico) lays one of golf’s “Jewels in the Desert” - Riverview Golf Course in Kirtland New Mexico. The par 72, championship length 18-hole course plays to a yardage of 6,908 from the back tees, with an opportunity for players to play from multiple tee locations to experience a variety of shots, views and fun. The old course, designed in a parkland style, with wide sloping fairways and large stately trees makes up the front nine at Riverview. 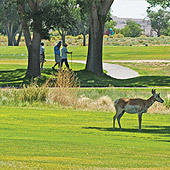 Originally built for use by El Paso Natural Gas employees, family members and friends, it served as the community golf course where many a beginner played their first round. The new back nine was designed by Baxter Spann of Finger, Dye and Spann Inc. and was added in 1999 utilizing a modern era links style. The course captivates golfers with gentle and not so gentle dogleg par 4’s and par 5’s, with holes like #11 - a Baxter Spann signature hole - framed with dramatic views of La Plata Range and historic Shiprock. Today, as home to the San Juan County “First Tee Program”, Riverview continues to be where players young and old and of all skill levels come together to enjoy a satisfying round of golf or to work on their game. As one of the finest practice facilities in the state, this double-sided driving range has over 50 tee stations with multiple putting and pitching greens as well as a state-of-the-art V1 Digital Coaching System housed at the indoor/outdoor Golf Academy. 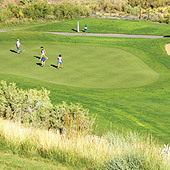 For more information or to book an event at Riverview, please call 505.598.0140 or visit our web site www.riverviewgolfnm.com. Public Course-18–Holes. Weather permitting, the course is open year round except Christmas and Thanksgiving. Tee times are recommended and reservations may be made up to 7 days in advance by calling the golf shop 505.598.0140 or book on line at www.riverviewgolfnm.com. Facility/Services: Fully stocked Pro Shop, two putting greens, two pitching greens, double tee driving range, seventy-two golf cars, rental clubs, pull carts, tournament services with on-site catering, PGA instruction, snack bar/grill and custom club fitting. 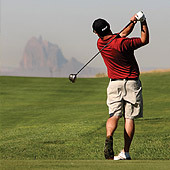 Fees: Please call 505.598.0140 for Senior, Twilight, and Wednesday special rates or visit us online at www.riverviewgolfnm.com. Getting There: The property is located just 10 minutes west of Farmington in Kirtland, New Mexico off Highway 64 on County Road 6520.